File this Minute under betcha didn't know and get your students talking! Take a look at the world map and have students do some thinking and describing of the relative location of Russia and Germany. Author Adkins does not share where in Russia these women were flying from, so have students think about possible flight patterns and measure distances. Have students investigate where the Russian and German front was and see if they can locate maps that would indicate where they flew their nightly missions. One of the surprising things about this story is the fact that this successful regiment was comprised exclusively of women. Have your students explore why this is surprising. Would this still be surprising today? What is the role of women in the military in their country? What restrictions are placed on women in militaries around the world? Are there some countries who have no gender restrictions? Is there ever a justification for a gender restriction? Invite your students to do some digging and have a respectful dialogue based in fact and research. How do airplanes fly? Get your students doing some hands on experiments and learning about how things fly using the Smithsonian National Air and Space Museum’s experiments, videos and explanations of all things flight related. 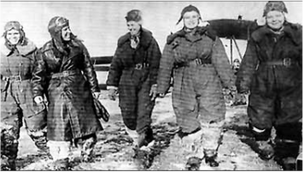 Typing the phrase “night witches” into a Google search bar yields more than 54 million results. How much can your students tell about a result from the snippet and url provided on the search results pages? Spend a class looking only at search results - no clicking on them!! Have students dissect them. There are usually ten results per page. Have students count off 1-10 and then look only at their number result on as many pages as they can (number 3 looks at the third result on page 1, then page 2, then page 3, etc.). Give them a graphic organizer to track their results. Using only the snippet, ask them to guess the intended audience and purpose of the web site along with their reasoning. After 15-20 minutes of collecting results, put them in their number group and have them compare answers and reach consensus, then do class share.